Fred Barnes writes about The Canadian Century, and the lessons it contains for America, in the Weekly Standard. Canada was called an “honorary member of the Third World” by the Wall Street Journal in 1995, and for good reason. Out-of-control spending, soaring debt, and the government’s bite of the country’s gross domestic product (GDP) growing at a furious pace—those trends prompted the Journal’s harsh putdown. Sound familiar? Those are exactly the trends that endanger America’s economy and standard of living today. Only with Canada there’s a difference. 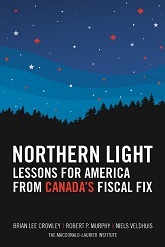 Beginning in the mid-1990s, Canadians came to grips with their fiscal crisis. They cut spending at both the national and provincial (state) level, reduced the size and payroll of government, slashed debt, and produced what Paul Martin, then finance minister and later prime minister, called smaller, smarter government. Canada is now in a far better economic situation than the United States. Its unemployment rate is lower, its budget deficit breathtakingly smaller (after nearly a decade of balanced budgets), its debt burden far lighter, its banks more stable. The Canadian dollar, once worth as little as .62 cents, is currently nearly at parity with the American dollar.